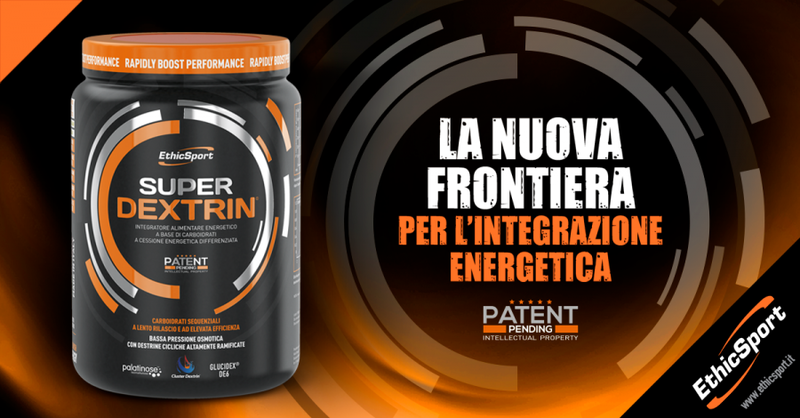 Home » Science & Sport » It was released SuperDextrin, the new era for energy supplements! In the last 2 years EthicSport released 13 new products thanks to research and development intense activity. EthicSport® products are made using only the best raw materials and following the highest production standards. The formulation of each product is unique and guarantees top performances during training and competition. Our experience comes from the field and is growing day by day thanks to the collaborations with professional teams, sports federations, medical staffs and Universities. SUPER DEXTRIN is our last product released by EthicSport. It has a series of unique and particular features, which permitted the formulation PATENT. SUPER DEXTRIN is a “SUPER MALTODEXTRIN”, it permits a steady energy flow, useful for athletes carrying out intense activities, mainly endurance. This product contains innovative ingredients. Palatinose™ => is a special carbohydrate with low glycemic index, helps to improve fat oxidation during physical activity. Maltodextrins DE6 and DE18 => permit a more gradual energy release to the body. Find out all the secrets in the introduction VIDEO! What are the Super Dextrin advantages? It releases energy gradually to the body, useful for athletes carrying out intense activities, mainly endurance. The special blend generates less insulin peak than normal maltodextrin, permitting to the body energy reserves coming from fats. Super Dextrin is a real revoltion in energy supplements, useful for athletes carrying out intense activities, mainly endurance, supply carbohydrates with high molecular weight and allows a steady glucose supply. This permits to have long lasting energy. This product is recommended in pre-workout and during the activity, in several sport. SUPER DEXTRIN IS THE NEW ERA FOR ENERGY SUPPLEMENTS!